I wish I could tell you why there is such a stigma surrounding therapy, but through all of my research I still can’t find a solid answer. I’ve been on my moms insurance my whole life- she’s a nurse in the town that I grew up in and has been for the past 20 years. When I was in Connecticut last week, my mom told me that she was probably going to get laid off over the next year, which means that I’ll be on my own with insurance. In high school, you’re not taught anything about taxes or insurance- but most kids are on their parents insurance until (up to) age 26. I’ve been on my own financially since I moved out at 17, besides some occasional pocket money my parents will give me now and then: but now that my mom sprung this on me, I’ve been planning how I’ll afford my expenses & therapy when my insurance ends. Side note: it’s 2018, I’m 20-years-old and I shouldn’t have to be thinking about paying my own medical bills when no one in Europe has to? America is a CRAZY country. I’ve been seeing my therapist for over 1 year now, and she’s someone that I found via a website called Maven. Prior to that, I was seeing someone in my hometown that my mom knew who I eventually felt like wasn’t helping me but kind of just saying yes and no to questions I’d ask. Here’s the thing you need to know about therapy: you can’t walk in expecting solutions for your problems. When friends ask me why I go to therapy or if I suggest they go to therapy, I say that everyone should go to therapy if they can AND are willing to admit they need help in certain areas but not because they need someone to tell them what to do/not to do. I spoke at a conference some time ago and was given a free coupon code to test Maven out: it’s a digital clinic for women that offers different services from therapy to nutrition advice etc, etc, and I ended up clicking on a therapist in New Jersey who I Skyped with. At the time I was living in Boston and had never tried therapy via a phone. I always enjoyed sitting in a room 1 hour a week with my therapist, but I found myself slacking when I’d get too busy because I didn’t have the time to go into the office. I’ve been seeing my therapist on FaceTime just about every week since I redeemed that free code. Since I have insurance right now, my mom pays the co-pay every week. 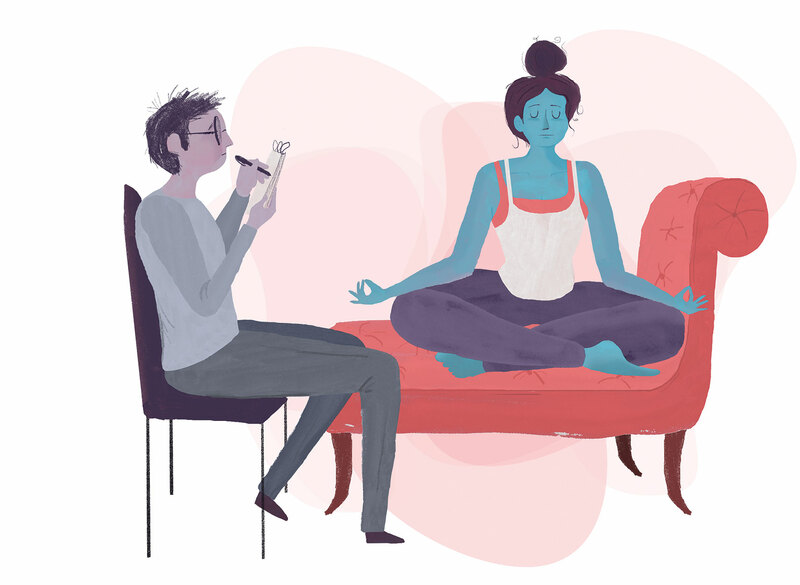 My therapist has become more of a “mentor” figure for me than anything because she truly does advise me with business needs and with personal needs, but most therapists aren’t like mine. It really depends on what you’re looking for with a therapist, so feel free to shop around like I did before you pick yours. I think my co-pay is $35. Side note: Maven still has a code for a free session on their homepage! Use the free codes you can get from Talkspace & Maven (both online therapy platforms) to see if you like therapy before you go deciding how to budget a certain amount for a session every week. There are people who simply hate therapy and would prefer to sit alone in a room and meditate or talk to a friend instead of someone else. If you don’t have insurance and desperately need someone to talk to…check out these resources. Some are free and some aren’t. But when you call someone will be able to advise you on who to speak to after you call in. If you’re in college…utilize resources at your school. I found my guidance counselors & school therapists to be really s**** when I was in high school and not even moderately interested in helping me, but you may be able to get some references for local people in your area who you can talk to (free or paid for) by asking someone at your school. See if you can buy a package: some therapists may offer packages so that every session is less money if you buy more upfront. These are just a few of MANY ideas for getting you the therapy you want- I hate knowing that so many young people out there want therapists and don’t feel like they can ask their parents for help, or like they can afford it on their own. Your mental health is an investment in yourself- and if you find yourself really seeing progress after a while, then you know starting therapy was the right move. Don’t let anyone put you down for your decision or question your decision to go to therapy- focus on you, no one else matters!